A lot of pro traders say that you should let the market come to you instead of forcing trades. Well, I definitely should have listened to them! As I mentioned in my update last week, I was looking at EUR/USD’s 1.3400 area as a possible retracement level. Heck, I even noted that the possibility that the pair could test the 200 SMA some time during the NFP report! I entered at market (1.3382) when I saw that price had started dropping from the 38.2% Fib. At the time I was thinking that I REALLY didn’t want to miss any more of EUR/USD’s downward momentum. I risked 0.25% of my account and placed my stop loss just above the 200 SMA. I also kept it open during the NFP report since a lot of market players had been pricing in strong jobs figures for Uncle Sam. Unfortunately, the NFP numbers weren’t as strong as many had predicted. As a result, EUR/USD shot up my stop loss area. Two things I could have done better. First, I could have taken out my position ahead of the NFP release. They didn’t call it a monster report for nothing! I could have waited until after volatility has died down before pricing in my fundamental bias. 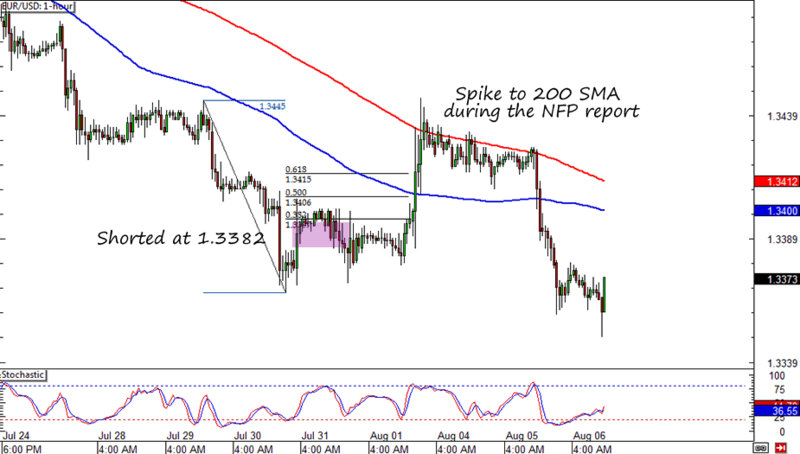 I also could have entered another short when EUR/USD was having trouble breaking above the 200 SMA. If I had entered another short position at around 1.3420, I probably would have regained my losses by now. Right now I doubt that the NFP report has changed the fundamental landscape for the pair. There’s also a chance that we’ll see more euro weakness when Russia details its plans against the US and euro area’s economic sanctions. How about you? Do you think the pair isn’t done falling and that there’s still room for another short trade?